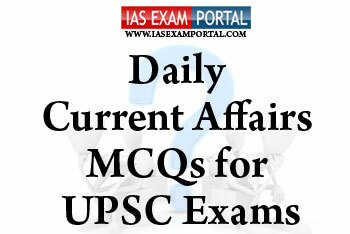 Current Affairs MCQ for UPSC Exams - 07 FEBRUARY 2019 | IAS EXAM PORTAL - India's Largest Community for UPSC Exam Aspirants. Q1. Which of the following statements regarding the newly developed concept of Ease of doing Agri-business index are true ? 1) The concept is to consider farming not solely as a production oriented activity carried out to achieve food security for the country, but as a business activity carried out by farmer as entrepreneur. 2) The proposed index has taken the aspects of increasing production/productivity, increasing price realization of agri produce and decreasing input costs of production, risk mitigation and investment related attributes. 3) The Government has been reorienting the agriculture sector by focusing on the concept of income-centeredness which goes beyond achieving merely the targeted production. Q2. This type of climatic zone is found between 40° and 55° North and South. They lie far away from the influence of the sea, in the heart of continents.This dry climate exists in the interior regions of the North American and Eurasian continents. Moist ocean air masses are blocked by mountain ranges to the west and south. These mountain ranges also trap polar air in winter, making winters very cold. Summers are warm to hot.Short grass grows everywhere. Trees appear only on the slopes of mountains. 1) The State Governments have been given flexibility to implement PMJAY either through insurance companies, or directly through trust/society, or in a mixed mode but they cannot change the rates of pre –defined package treatments fixed by the centre. 2) National Health Agency (NHA), registered as a society, has been setup by the Government to implement PMJAY through State level Health Agencies. 3) As far as private hospitals under PMJAY are concerned, defined criteria and hospital empanelment guidelines have been adopted. Moreover a three tier grievance redressal structure is also available to process grievances. Q4. As per information of the Botanical Survey of India (BSI), an organization under Ministry of Environment, Forests & Climate Change estimated more than 8,000 species of medicinal plants are found in India. Which of the following are the measures taken by Govt.of India to encourage farming / cultivation, conservation, processing and promotion of medicinal plants throughout the country ? 1) Central Sector Scheme on “Conservation, Development and Sustainable Management of Medicinal Plants” to support in situ/ex situ conservation along with promotion of marketing and trade of medicinal plants produce. 2) Introduction of anti-dumping duties on the imported Chinese and European medicinal plant products in the Indian market. 3) Voluntary Certification Scheme for Medicinal Plants Produce (VCSMPP) aimed to encourage Good Agricultural Practices (GAPs) and Good Field Collection Practices (GFCPs) in medicinal plants and enhance quality and safety of their produce. Q5. India and Monaco vowed to deepen ties in trade and investment, as well as collaborate on combating climate change recently.It was announced that diplomatic visa waiver will be granted to Monaco for visiting India and officials from both sides will be working to finalise this agreement. The country Monaco is bordered on three sides by France,while the other sides are bordered by which of the following seas ?